However, these differences are a matter of degree. Overwhelming numbers of Republicans and Democrats say the federal government should have either a major or minor role on all 13 issues tested. Relatively few in either party want the government to have no role in these issues, though 20% of Republicans say the government should have no role in ensuring health care. Throughout most of this report, Republicans and Democrats include independents and other non-partisans who lean toward the parties. In virtually all situations, these Republican and Democratic leaners have far more in common with their partisan counterparts than they do with each other if combined into a single “independent” group. See appendix A for more detail. At a general level, the public finds the government frustrating and badly managed. Just 20% say the federal government runs its programs well, and 59% say it is in need of “very major reform,” up 22 percentage points since 1997. These assessments stand in contrast with the public’s more mixed views of government performance at a specific level. In 10 of 13 areas included in the survey, the balance of opinion about government performance is more positive than negative. In several areas, Democrats and Republicans give the federal government similar ratings: Large majorities of both Democrats and Republicans say it does a good job of responding to natural disasters (82% and 78%, respectively) and setting fair and safe standards for workplaces (79% and 77%, respectively). Roughly half in each party say the federal government does well in maintaining roads, bridges and other infrastructure (52% of Democrats, 50% Republicans) and ensuring access to high-quality education (54% of Republicans, 52% of Democrats). However, there are substantial partisan differences in views of government performance on a pair of issues that are likely to be important in the 2016 campaign. Republicans are half as likely as Democrats to say the government does a good job in strengthening the economy (34% vs. 68%). And the gap is as large in perceptions of government performance in ensuring access to health care (40% of Republicans vs. 74% of Democrats). Notably, neither Democrats nor Republicans give the federal government positive ratings when it comes to helping people get out of poverty. Just 42% of Democrats and 30% of Republicans say the government does well in lifting people out of poverty. For Democrats, the low ratings come on an issue for which there is broad support for large-scale government involvement (72% of Democrats favor a major government role). By contrast, Republicans are highly critical of government performance on poverty, but just 36% say government should have a major role in addressing this issue. The government gets very negative ratings from members of both parties for its management of the immigration system. Four-in-ten Democrats think the government does well on immigration, compared with 15% of Republicans – the lowest rating among Republicans for the government’s handling of any issue. Are Republicans now ‘angrier’ at government? For years, the public’s general feelings about government have tended more toward frustration than anger. Other general attitudes about the federal government have moved in a more negative direction over the past two decades. Nearly six-in-ten (59%) say the government needs “very major reform,” up from 37% in 1997 during the Clinton administration. Most of the change has come among Republicans – fully 75% say the government needs very major reform, up from 43% in 1997; among Democrats, 44% say the government needs sweeping reform, compared with 31% then. Republicans also are far more likely than Democrats to say that the government is wasteful and inefficient (75% vs. 40% of Democrats) and to give the government a “poor” rating for how it operates its programs (50% vs. 18%). While overall views of the federal government are very negative, there also are several indications of widespread dissatisfaction with the current state of politics. 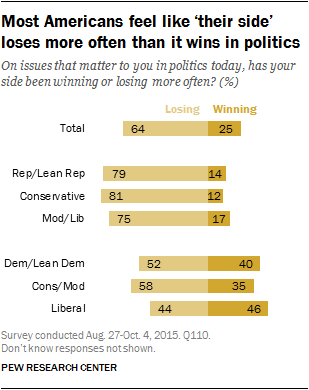 In politics today, far more people say “their side” – however they perceive it – is losing more often than it is winning. Cynicism about politics also is reflected in the public’s attitudes regarding money in politics. Fully 76% say that “money has a greater influence on politics and elected officials today than in the past.” Just 22% say the influence of money in politics is little different than in the past. And, as both parties’ nominating contests continue, 64% of all Americans – including 68% of Democrats and 62% of Republicans – say that the high cost of a presidential campaign “discourages many good candidates from running.” Just 31% overall say that the high cost of presidential campaigns does not discourage good candidates from running. 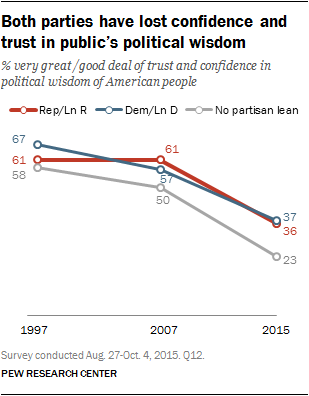 Increasingly, Americans even express less confidence in their own collective political wisdom. Just 34% say they have a very great deal or good deal of confidence in the wisdom of the American people when it comes to making political decisions, while 63% have little or no confidence. In January 2007, these opinions were almost the reverse – 57% had at least a good deal of confidence in the political wisdom of the people, while 41% did not. The loss of confidence cuts across the political spectrum: 36% of Republicans have at least a great deal of confidence in the public’s political wisdom; 61% did so in 2007. The decline has been about as large among Democrats (57% then, 37% now). Negative views of elected officials are hardly a new phenomenon – for years, large majorities have faulted elected officials for losing touch with Americans and not caring about the views of average people. But with the election approaching, the criticisms of elected officials have taken on an especially sharp edge. Just 22% of the public say that most elected officials put the interests of the country ahead of their own interests; 74% say they put their own interests ahead of the nation’s. When asked if certain traits apply to elected officials – as well as to business leaders and the typical American – most people do say the term “intelligent” describes elected officials very or fairly well (67%). However, just as many view the “typical American” as intelligent. Somewhat more (83%) say the term describes business leaders well. And elected officials receive very low marks for honesty. Just 29% say the term “honest” describes elected officials. That compares with 45% who say business leaders are honest and 69% who say the same about typical Americans. A large majority of the public (72%) also views elected officials as “selfish” – but that criticism is not unique to politicians. Comparable percentages also say the term applies to typical Americans (68%) and business leaders (67%). Perhaps the most withering critique of elected officials is the belief – shared by a majority of the public – that “ordinary Americans” could do a better job than they could of solving the nation’s problems. Most Americans (56%) acknowledge that the problems facing the country do not have clear solutions. 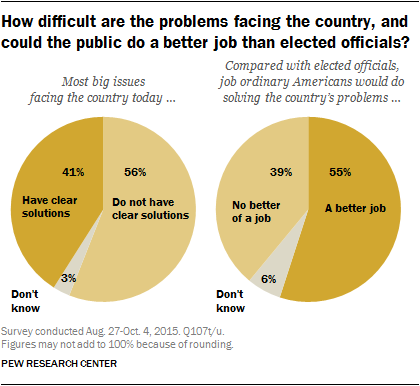 Even so, most (55%) also say ordinary Americans could do a better job of solving national problems than elected officials. There are few meaningful partisan differences in views of elected officials. 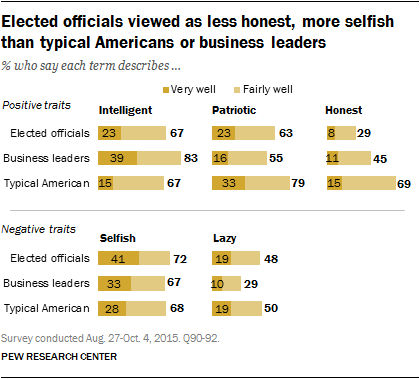 Nearly identical shares of Republicans and Democrats view elected officials as intelligent, honest and selfish. However, Republicans are somewhat more likely than Democrats to say that ordinary people are more capable of solving the nation’s problems (62% vs. 49%). ‘Anger’ at government and views of GOP candidates. Donald Trump is viewed more favorably by the nearly one-third of Republicans and leaners who are angry at government (64% favorable) than by those who are frustrated or content with government (48%). Other GOP presidential candidates (Marco Rubio, Ted Cruz and Ben Carson) also get higher favorable ratings among Republicans who are angry at government than among non-angry Republicans, in part because they are better known among the “angry” group. In contrast, Jeb Bush’s favorable rating is 18 percentage points lower among “angry” than “non-angry” Republicans (57% vs 39%). Deep partisan divides among the politically engaged. When it comes to the role of government in specific areas, already-wide partisan gaps grow even wider among politically engaged adults, particularly over government’s role in health care, poverty assistance, education, environmental protection and the economy. For example, fully 90% of politically engaged Democrats say the government should have a major role in ensuring access to health care; just 21% of politically engaged Republicans agree. Among less-engaged Democrats and Republicans the differences are not as dramatic (79% of Democrats vs. 47% of Republicans). Views of government agencies. 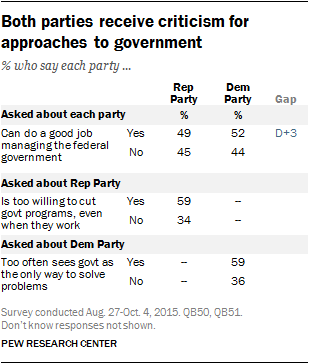 Most government agencies continue to be viewed favorably by majorities of the public. Fully 84% have a favorable view of the U.S. Postal Service – the highest rating among 17 agencies and departments tested. But just 39% have a favorable opinion of the scandal-plagued Department of Veterans Affairs, and its favorable rating has plummeted 29 percentage points since 2013. Is politics a contest between right and wrong? Most Americans reject the idea that “politics is a struggle between right and wrong.” However, 53% of conservative Republicans do see politics this way – the highest share of any ideological group. Opinions of the political parties and governance. Similar shares of the public say the Democratic Party (52%) and the Republican Party (49%) could do a good job managing the federal government. 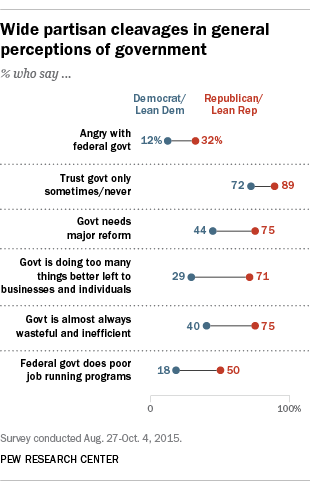 Yet both also are criticized for their approaches to governance: 59% say the GOP is too willing to cut government programs, even when they work; an identical percentage (59%) says the Democratic Party too often sees government as the only way to solve problems. Young people less confident in the nation’s direction. About four-in-ten adults younger than 30 (38%) say they have “quite a lot” of confidence in the nation’s future. Among those 50 and older, 50% are highly confident in the nation’s future. Views of other national institutions. The federal government is not the only national institution viewed negatively by the public. A majority (56%) say large corporations have a negative impact on the country, while an identical percentage says the same about the entertainment industry. And nearly two-thirds (65%) say the national news media has a negative effect on the country. Opinions about taxes and government. While the public expresses a range of negative assessments of the government, there continues to be limited public outcry over personal tax burdens. Slightly more than half (54%) say they think they pay about the right amount in taxes, considering what they get from the federal government. At the same time, 52% say that most Americans demand more from the government than they are willing to pay for in taxes.